Catherine Walker was born in France in June, in 1945. She established the Chelsea Design Company Ltd. In London in 1977 with no formal training in fashion design. Her educationl background was in philosophy, for which she took a Maître-és-Lettres, roughly the equivalent to a UK doctorate. 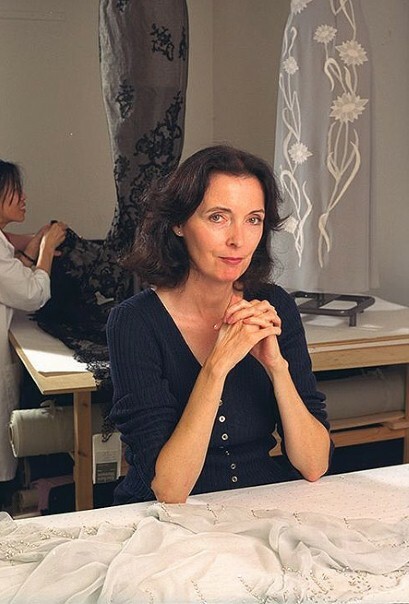 Walker claims the title of her company, which did not bear her own name until 1993, was in deference to her lack of experience as a fashion designer. The decision to start her own company was made when Walker was widowed in 1975 and left with two young children. She began making children’s wear, and the transition to making maternity wear was in fact a natural one, according to Walker, since the pregnant female form resembles the generally shapeless figure of a child. Walker affirms that it was many years before she thought of herself as a fashion designer, and that it was a purely technical interest in the construction of garments which initially inspired her. During the first 12 years of business Walker consolidated her knowledge of pattern cutting, fitting, and sewing, and later couture dressmaking, and tailoring. As her reputation grew by word of mouth, she attracted press attention, and British Vogue first photographed one of her dresses for its January 1982 issue. Although the designer's clothes have been regularly featured in editorial fashion pages, Walker is renowned for her dislike of publicity and has never held a catwalk show. She views her personal development as a designer in a series of stages—first dressing, then tailoring, followed by embroidered decoration and, finally, draping. During her career, she has received two Designer of the year Awards, the first the British Couture Award in 1991 and the Glamour Award in 1992. She is an expert pattern cutter, fitter and seamstress. While the bulk of her business is the made-to-measure couture collection, Walker also produced a ready-to-wear range called De Luxe and has designed hats made for her by Mailson Michel in Paris. She designs both fine jewelry and a collection of costume jewelry, which include earrings and bracelets to accessorize the clothes. Walker also designs a collection of couture bridal gowns which she launched in 1986 with the opening of a second shop on London's Fulham Road. She, along with others, was responsible for designing the wedding dress worn by Lady Helen Windsor at her marriage in July 1992. Walker is perhaps best known for her creations for the late Princess of Wales, which attracted widespread publicity for her as a couturier, although she had always tried to avoid this aspect of the fashion world. 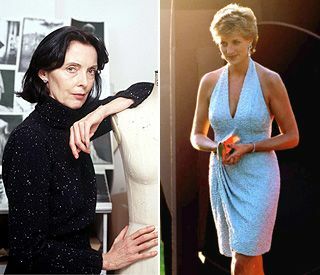 She is also the designer from whom Princess Diana purchased the maximum number of clothes, often crating a complete wardrobe for her foreign tours. Catherine Walker started with some maternity dresses which Princess Diana ordered in 1981. When she discovered Catherine Walker, Diana found what she needed. A designer who would concentrate on her needs. The Frenchwoman was to provide most of her clothes for 15 years and always give her personal attention. She designed by far the majority of Diana’s evening wear and this was reflected in tehe enormous number of her dresses that were sold in the Christie’s Charity Auction in New York in 1997. Catherine's name is pronounced 'Catreen'. She is an intense, reclusive French woman with a doctorate in aesthetics and an informed interest in social history and art. Walker was aware of the responsibility entailed in dressing the Princess. Diana was sending signals to her public through her appearance. Catherine found new ways for the Princess to win support and during the 80's gave her a radiant mystique. As a French woman in London, Walker was at a distance from designer rivalry and fashion politics and was the perfect partner for the production of the 'Diana' image. After Diana's death, Walker was outraged when the Victoria & Albert Museum refused to display the Princess' gowns and dresses in 1999, mostly designed by Walker. 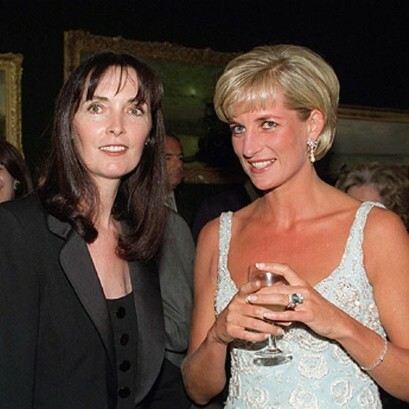 Many Brits took this as an affront to Diana's memory, especially when the London museum had expressed interest in displaying a dress worn by Posh Spice, a member of the pop recording group Spice Girls, and one from Sophie Rhys-Jones was already on the premises. The imbroglio came a year after Walker published her autobiography, recounting her experiences dressing Princess Diana. Catherine Walker's impressive clientéle, which listed not only British but foreign royalty, bears testament to her skill as a designer, despite the fact that she did not consider herself one for the first dozen years of her successful business. It is her tailoring and decorative use of beading that have become the hallmarks of Walker's designs. There is always an emphasis on the midriff, which Walker attributes to her French background. This structured effect around the waist, which though not fitted gives the illusion of elongating it, is apparent not only in her tailored jackets but on both day dresses and evening gowns. British journalist Lisa Armstrong, writing in the Independent (London, 16 July 1992), believes Walker's skill as a couturier lies in her ability to create clothes possessing the subtle, unlabored tailoring that on the surface seems not to be doing anything, but somehow manages to eliminate unwanted contours and add curves. Another characteristic of Walker's designs is her use of plain colors such as black, navy, cream, and red, which are enhanced not through the use of printed textiles but with applied decoration such as hand-embroidery, heavy beading, and frogging. Her attention to detail is legendary; articles about the designer mention how she has been known to fly to Paris to find three buttons for a particular jacket. Joely Richardson, Olivia Williams; Amanda Holden; Tasha de Vasconcelos, Emilia Fox, Lucy Liu to name a few as well as young members of the Royal Family, such as Viscountess Linley, Lady Helen Taylor, and Lady Gabriella Windsor.